Make no mistake, every race I run in 2018 will be dedicated to my mom, who is battling glioblastoma, a terminal brain cancer. I don’t know how long I have with her, but I’m pounding the pavement to show her my support and love. She knows what goes into my training and how much it means for me to complete a marathon. All the finish lines in my life will go to my mom. She is a warrior. It’s just one small way I can recognise her fight with this terrible disease. Nicole and I finishing the Richmond Marathon, November 11, 2017. We will share the course again in Houston on January 14, 2018. Back in 1999, I had the crazy idea to run a marathon. I was living in Galveston at the time and had looked to run the Cancun Marathon (because who doesn’t want to go to Mexico??). This didn’t work out, so I looked closer to home, and settled on the Houston Marathon, which would take place in January of 2000. I ran the warm up series – a 20K in October, a 25K in November and a 30K in December – as part of my preparation for the marathon. However, I was in significant pain (knees) in the last few miles of the 30K, and in spite of some rest after the race, I was not able to get back to it. So my marathon dreams were pushed aside, and I honestly never thought I would run one. Let alone the Houston Marathon. Fast forward 16+ years, when this story started back up again. June 21, 2016, when I registered for the 2017 Houston Marathon. For about four months, I was looking forward to a rematch with this race, and also looking forward to seeing some friends from my time in Galveston. At some point in the early fall 2016 (probably October), my husband told me he had to go to Bermuda for a work trip in January 2017, a trip that was around the same time as the Bermuda race weekend. Having also lived in Bermuda, I was happy to return to the island I called home for seven years. With island accommodations secured, I decided to defer my visit to Houston until January 2018, running instead the Bermuda Marathon. 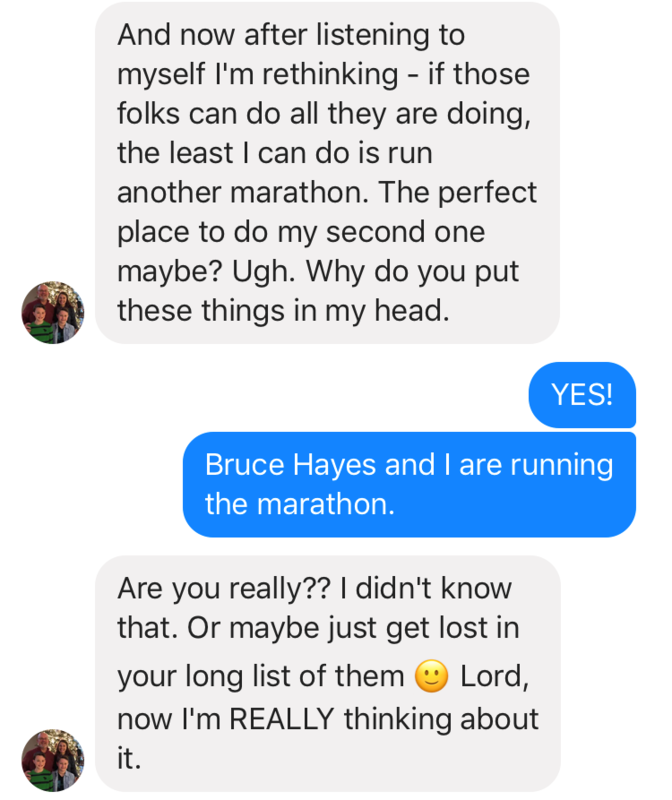 At some point over the summer of 2017, I asked my friend Lashell if she wanted to join me, and she replied that she already had race plans that weekend for a back-to-back half marathon extravaganza. No worries at all. I was looking forward to hearing about her race experiences, as she was looking to run some races I was considering for future years. Then September 2017 comes along, and with it, Hurricane Harvey, which completely destroyed the hopes, dreams, and posessions of so many people in and around the greater Houston area. My friend Keith felt so compelled to raise money for hurricane relief victims, he ran the Hokie Half and was able to raise more than $2000. This money was donated to St Andrew’s Episcopal Church, which has an amazing ministry in the Pearland area. Many people there are underserved, and they do incredible work, but they can always use some help. I predict a solid finish by Keith. I love being an instigator. But the story doesn’t end there. After Keith shared his plans for marathon #2 with the friends in Meg’s Miles, a few others decided to join in for one reason or another – all with the goal of supporting Keith as ran for those who struggled after Hurricane Harvey. One of which is my new friend Nicole, with whom I randomly shared the most challenging miles of the Richmond course in November as we both struggled. Another friend Bruce lives in the area and he will be guiding a blind runner, hopefully to a Boston qualifying experience. Bruce and I had already been in touch about me being there, so adding to the group became fun. This was going to be a great weekend. 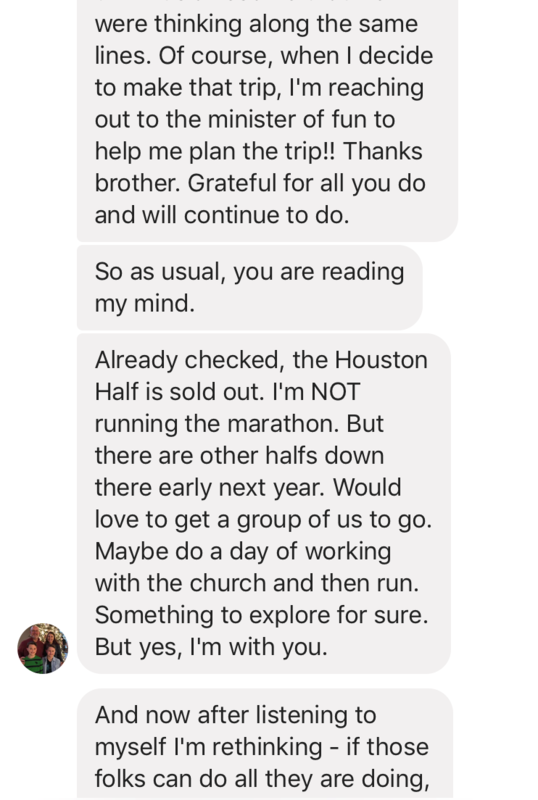 Then my friend Lashell, who had previously turned me down for the invite to run Houston, messaged me to say she and another running friend (my sassy friend Dee, who has shared the course with me in Tulsa, Baton Rouge, Chicago, and Richmond) never signed up for the original race weekend extravaganza they had planned. So after discussion between themselves, they felt the pull to make travel plans to Houston in mid-January 2018. The full marathon. Bam! (Try to turn me down again, Lashell. Apparently you can’t avoid me, even when you actively try to!) 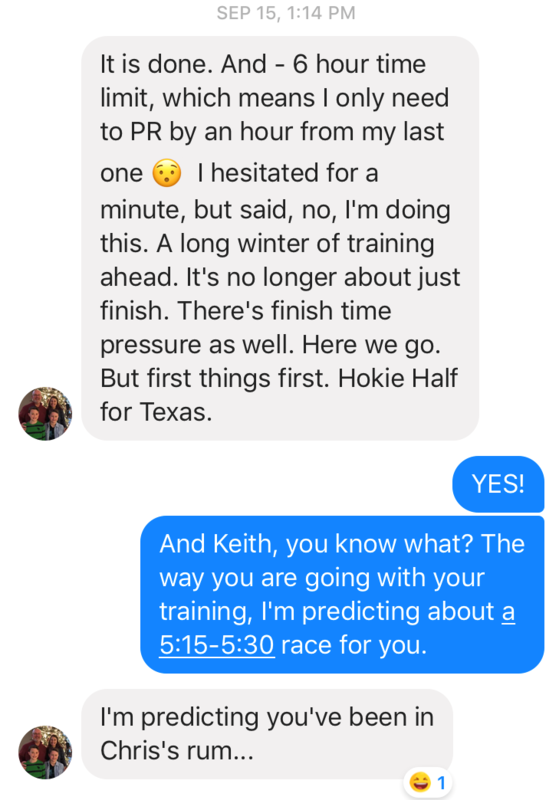 Keith even agreed (on camera, mind you) to take an ice bath WHEN he finishes the Houston Marathon within the six-hour time limit (it will be a PR of about 57 minutes to make the cut off, and he’s been training, so we know he can do it). We may look like a bad 80’s band album cover here, but we are looking forward to a weekend together serving the greater Houston area. Shortly after, Keith’s wife Katie said she would run the 5K, one of her first few races she will have done. Several people Keith knows have committed to running their first 5Ks in Houston. Another Meg’s Miler, Tracey, decided to register and surprise Keith with the news in early December. Oh my! This has become quite the group, all coming together to share in the experience of supporting our friend who has spearheaded fundraising to help a community in need. I’m even more excited that while there, we will have a chance to offer some hands on assistance in the community, and we will be speaking at a career day at the local school. We want to offer hope. We want to share our talents, time and energy. We want to remind these people, some of whom are living in dire conditions and facing incredible hardships, that they are not forgotten. That there are those who care and want to lend a helping hand. What started out as a dream delayed in another lifetime many years ago has come to be this beautiful gathering of friends who are working together to bring light and hope to those who have experienced hardship and tragedy. My one word for 2018 is service, and I am so happy that my year is starting with a great opportunity to live out this word: service. Thank you Keith for being that catalyst to bring this group together for a bigger purpose. Thankful to be a part of something bigger than myself – as always. What a special race weekend that will be. In so many ways. Best wishes for a great race. And, btw, I’ve decided on the word Mindful to frame my (running, writing, and blogging) resolutions this year. Thanks again for the idea. That is a great word! I love it. I’ll keep it in mind for next year. Looking forward to see how your journey with mindfulness plays out this year.